Karen Bassett is one of Britain’s top carriage drivers and has competed as part of the British Team on numerous occasions at the World Four-in-Hand Carriage Driving Championships. Karen has been awarded the British Driving Society Road Driving Certificate for Commercial Operators of Horse Drawn Vehicles for a team of horses, you can therefore rest assured that your horse drawn funeral will be in the capable hands of an experienced carriage driver. Karen has done some of the most high profile funerals including the six children who died in the house fire in Derby, and had the great honour of taking King Richard 111 to his final resting place in Leicester Cathedral. Our white and black horse drawn hearses are available for hire throughout the Midlands, especially Derby, Nottingham, Birmingham and Leicester. However, we are happy to cover areas much further away and can supply a pink horse drawn hearse, a silver horse drawn hearse, or gun carriage if required. After arranging your funeral with Karen, please send us a Booking Form to confirm the details. 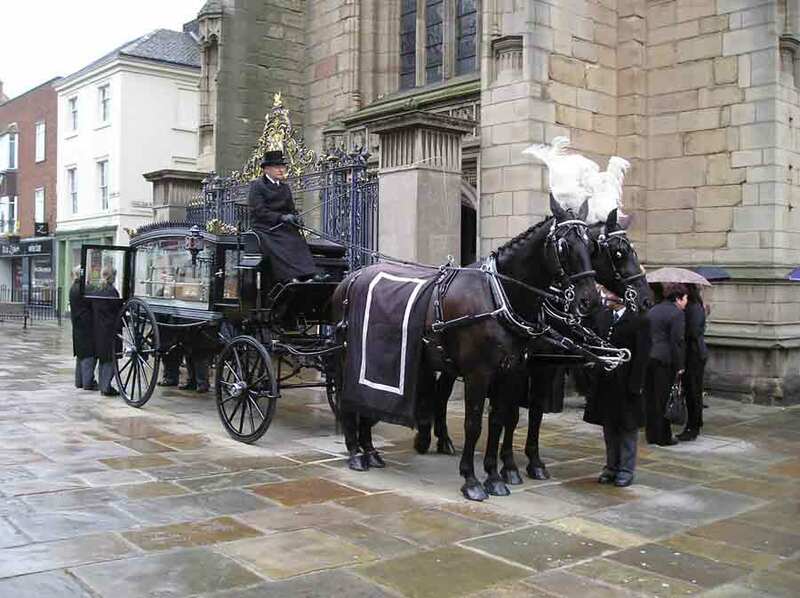 For horse drawn funerals she normally uses a pair of black Silesian or Hungarian horses, or a pair of greys, which are all trained to stand quietly and are extremely reliable in traffic. 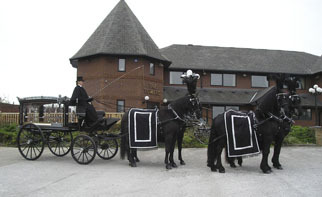 The Driver and Groom wear traditional Victorian livery and the horses are turned out to a high standard in English leather harness, with traditional collars. They usually wear black, white, pink, blue or purple ostrich feather plumes, but other colours are available. They also wear either black or white drapes. To see examples of colours and turnout, please go to the Gallery. 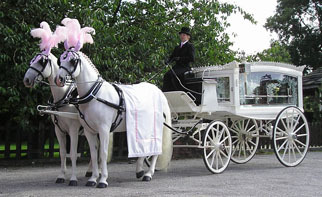 We usally use one of our black replica Victorian horse drawn hearses, or our white horse drawn hearse, but we can also supply a pink horse drawn hearse, a silver horse drawn hearse, or a gun carriage, if required. 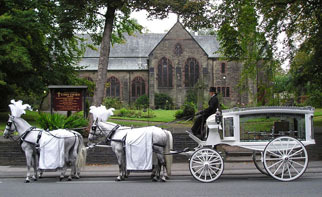 We use a pair of Hungarian dappled grey horses, Warwick and Windsor, and a pair of Lipizzaners to complement the white horse drawn hearse. They are as quiet and reliable as the black horses and will usually be turned out with white drapes and plumes. The horse drawn hearses will accommodate most of the American-type caskets, the internal measurements of the hearses being 34 inches wide by 90 inches long. They all have flower rails and traditional style carriage lamps. A team of four black horses, a pair or team of four grey horses, and a pair or team of four bay horses, are available by special arrangement. Our attractive grey horses are usually turned out with white plumes, but other colours are available, and they can be put to either the white, pink, silver, or black horse drawn hearse. The white and pink horse drawn hearses are especially appropriate for a child's funeral, or for those people who require a less sombre feeling. Karen and her experienced team of drivers and grooms will provide a competent, reliable and trustworthy service, which re-creates the elegance of a bygone era. 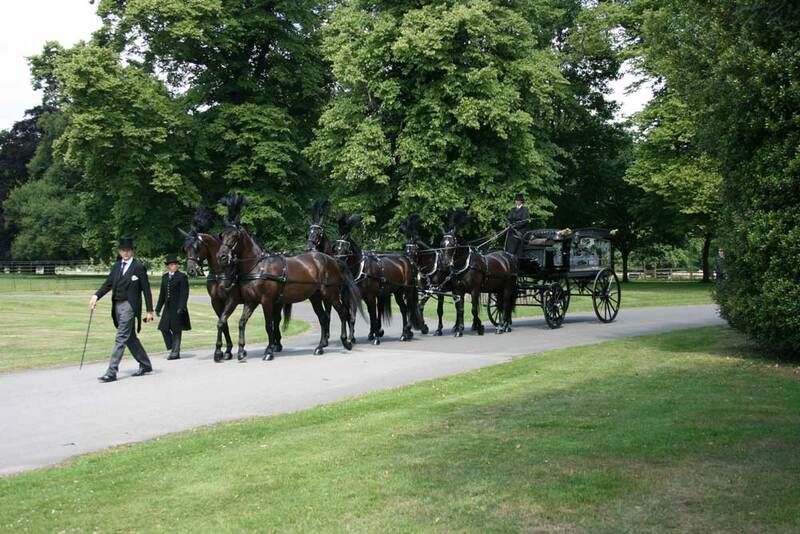 Although the horses are very fit, in the interests of their welfare, we would not expect a normal funeral cortege to exceed a distance of approximately 8 miles, with a duration of up to 2½ hours. There will be an additional charge for funerals which require more time. Owing to her central location in the Midlands, Karen is easily able to offer her services in and around Derbyshire, Nottinghamshire, Leicestershire, Staffordshire, Lincolnshire, Yorkshire, Lancashire, Northamptonshire, Warwickshire and the West Midlands. However, greater distances are no object, but travelling expenses would be negotiable. 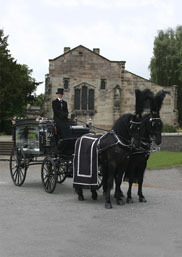 Our charges vary considerably depending on the number of horses and colour of equippage, for a black hearse and pair of black horses. For a quotation, or to discuss your requirements, please contact Karen. Payment is required on the day of the funeral unless other arrangements have been made. We do not accept liability for any loss, damage, inconvenience or distress caused if we are unable to fulfil a booking due to circumstances beyond our control e.g. breakdown, traffic jam, inclement weather, sick or injured horse.